I love this beautiful, calming cover, which features the author's own creations. One of my first thoughts when I saw the title was how much I love the subtitle. I wholeheartedly agree with the idea of injecting more meaning in our clothing. 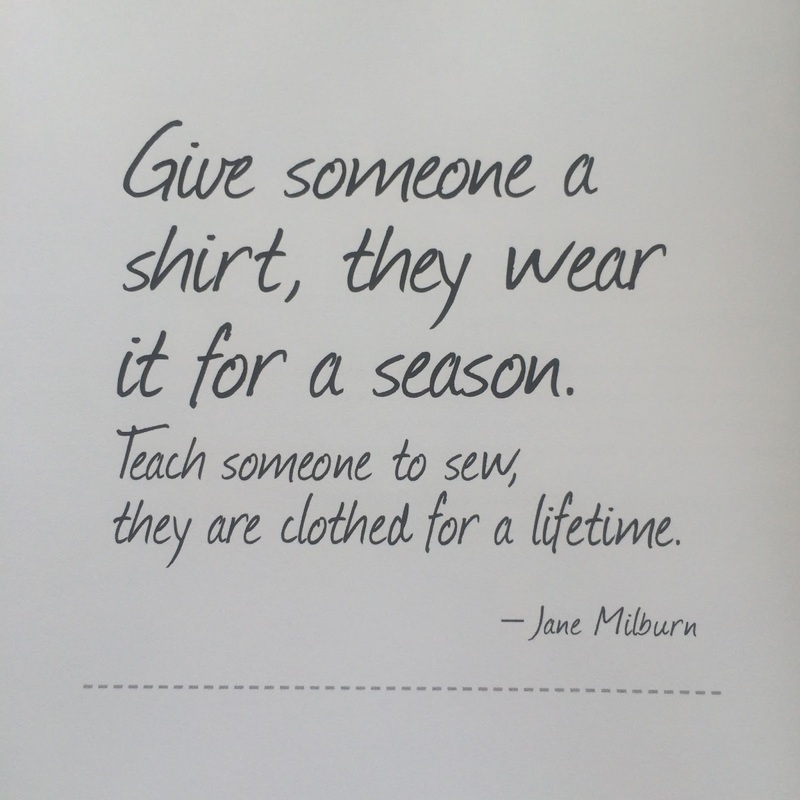 In my own work I've seen firsthand the difference between people who value their clothing and those who don't. While this book has a particular emphasis on making and upcycling your own clothing, I've seen the importance of value and meaning in purchased garments as well - the intention and thought going into what we wear has a strong influence on how much we buy, how well we take care of garments, and how long we hold onto clothing before donating and/or disposing of it. 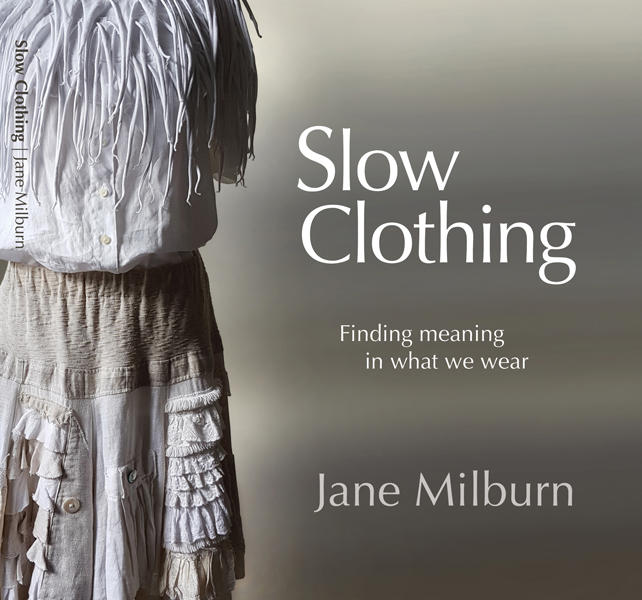 Milburn has a wealth of knowledge on issues of fashion and sustainability, and her passion for clothing and textiles is undeniable. The book is broken into six chapters detailing Milburn's purpose, journey, Sew it Again and Slow Clothing projects, slow clothing manifesto, DIY techniques and final reflections about the future from various community leaders. 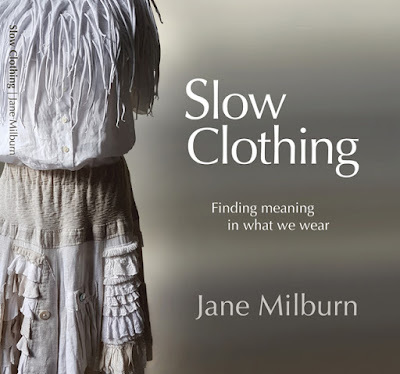 My favourite chapter of the book is Chapter 2, 'Authenticity', when Jane shares her journey to slow clothing. It's probably the social researcher in me, but I absolutely love learning about individuals' stories, especially when they are stories that have led to a sustainable transformation of sorts. Jane's story is a reminder that each of us have unique experiences that provide us with specific skills and interests to change the world around us. 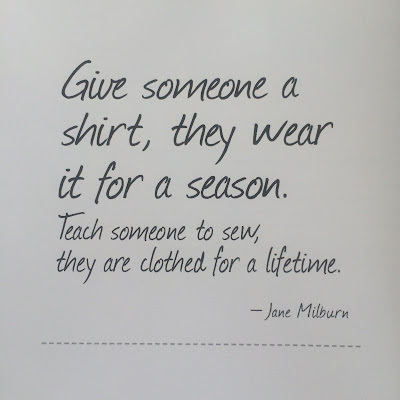 In her case, there are the sewing skills learned early in life, her role as a journalist, working and living in rural communities, hands-on environmental and leadership projects, and an ability to connect with people across each of these various roles and locales. Jane also shares very personal experiences dealing with loss, addiction and depression, and how these impacted her journey to slow fashion. 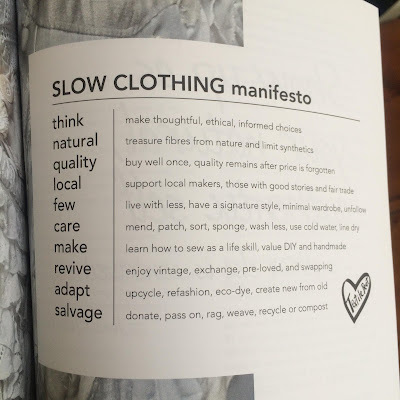 It is rare in the realm of clothing and fashion writing to find this type of vulnerability - no sugar-coating, no glamour, no jokes - and it greatly added to the message of the book about finding meaning in our clothing. 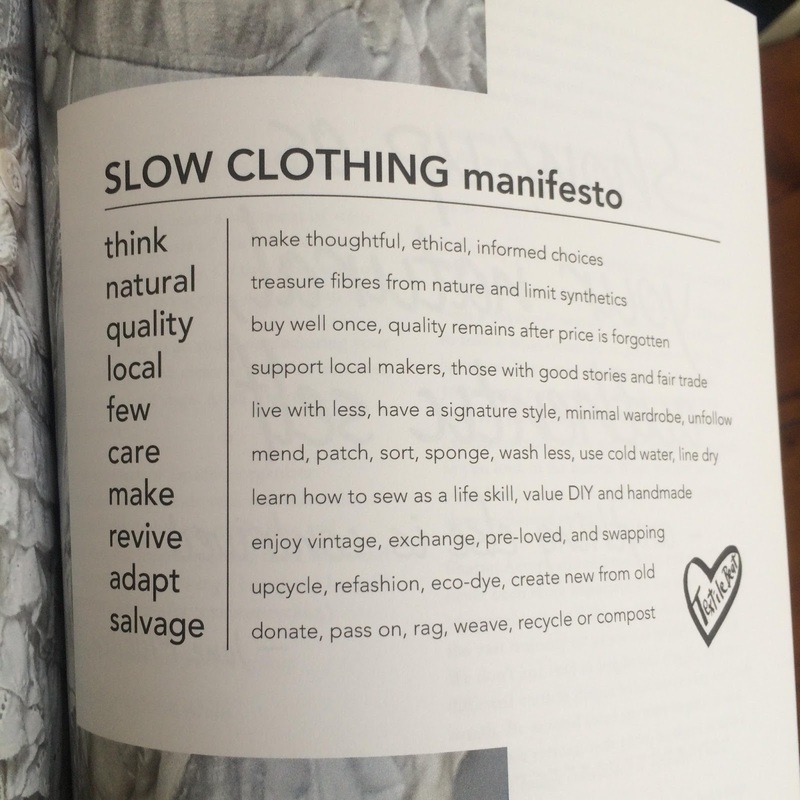 It's only when we are honest and open with ourselves that we can find meaning in life, including having the ability to connect with our clothing in a valuable and meaningful way, and a way that impacts more than our own self-image but also the planet, our communities, and even people working in the global garment industry. Making clothes to suit oneself is satisfying (I'd add that, if you're not a sewer yourself, altering and/or having clothes made to measure is also satisfying and confidence-boosting). Being sustainable may cost more, but is worth it in the long run. Embrace imperfection. Being perfect is impossible to maintain. [When it comes to sewing a garment], just give it a go. Learning comes from doing. and a length of elastic - made with only two seams sewn! And for sewing novices like me, Chapter 5 provides some extremely useful DIY techniques you can use to either mend your favourite garments or to get creative with upcycling of preloved clothing (whether your own or those you've found in op shops or markets). "You don't need a title or a badge to be a leader, you can just step up." As we wrap up another year, I think this is a wonderful notion to reflect upon. How can you step up to make the world a better place? No need for accolades or the spotlight, but just taking action for the sake of making a positive contribution. What experiences and skills enable you to offer something unique to the various issues and causes that need attention? We all have the ability to make a positive impact, if we just take the leap. I love this take on the famous fishing quote - nice one, Jane! On that note, I'd like to wish you and yours a joyous holiday season. Thank you for another wonderful year of sharing sustainability ideas. I'm signing off the blog now to enjoy the holidays, family, friends, and welcoming new Baby into the world.